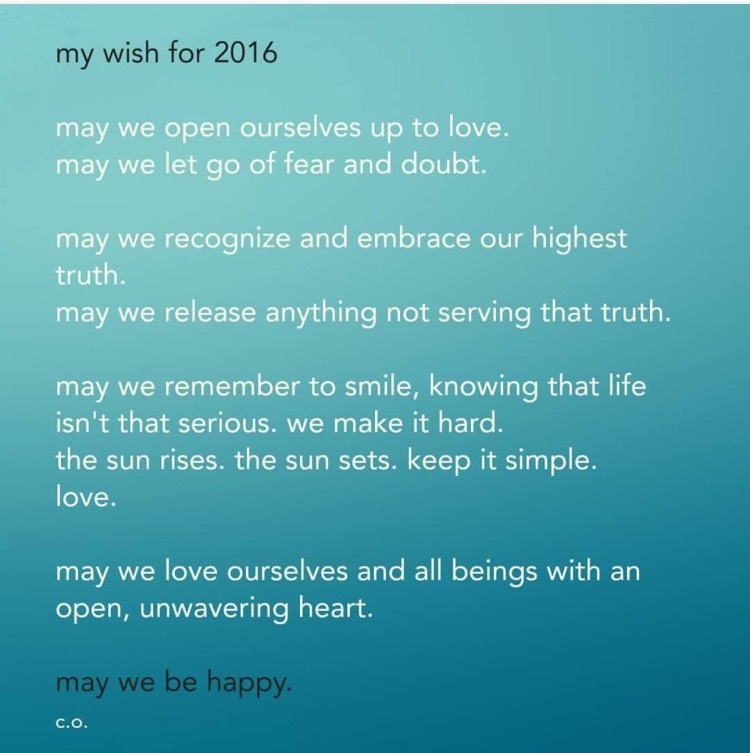 As we enter into a new year, this is my wish for you, for us and for all beings… May we open ourselves up to love. May we let go of fear and doubt. May we recognize & embrace our highest truth. May we release anything not serving that truth. May we take ownership of our lives. May we choose happiness in each moment. May we become aware of our ability to create our reality; understanding that nothing can upset us unless we give it the power to do so. May we recognize that the universe is within us; that we are apart of something much bigger than our physical selves. May we see that we are powerful beyond measure, while in the same breath completely insignificant in this physical form. We are but a speck of sand within the infinite universe. May we remember to smile. Knowing life really isn’t that serious. We choose to make it hard. The sun rises. The sun sets. Keep it simple. Love. May we love ourselves and all beings with an open, unwavering heart.